This year, marks the 20th year of the family-friendly event, which takes place on Oct. 24 and Oct. 31, with Ghost Train excursions departing at 4, 5:15, 6:30 and 7:45 p.m. An additional 2:30 p.m. train departure time is being added on Oct. 31. Today, Track or Treat Halloween Express has grown into a two-Saturday event during the end of October. 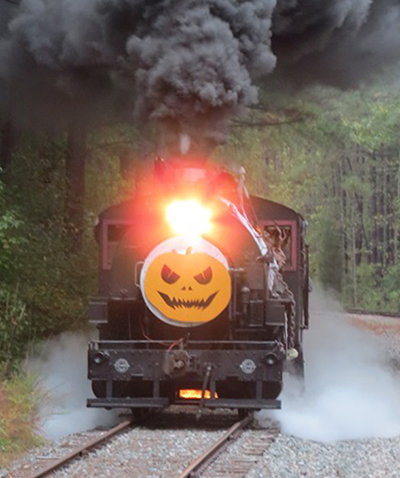 Along the 8-mile round trip train route, riders will see interactive Halloween scenes. The decorated haunted rail yard will include a 20-foot black cat and pumpkins atop the North Carolina Railroad Museum store train car singing Monster Mash, Ghostbusters and Michael Jackson’s Thriller. “We strive to make our Track or Treat Halloween Express event suitable for all ages to enjoy. It’s a fun event for both children and those who are still children at heart,” said Dave Chasco, NHVR marketing director. Next Topic: Doc Christmas… Is This The Ultimate Story of Trains at Christmas?